Chelsea left-back Ben Gordon has arrived at Scunthorpe on loan for the remainder of the season. Gordon, 19, was signed in January but Chelsea were unwilling to release him until he had recovered from a hamstring injury sustained on loan at Kilmarnock. He told the Scunthorpe United website: "It has been four or five weeks back at Chelsea injured. "So it's just nice to be here with the chance to start training and get a week under my belt before the first game." He added: "It's really all about getting to know people in my first week and see what it's all about. "It has been really frustrating not to be able to play." 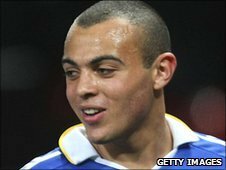 Yorkshire-born Gordon played 17 games and scored once for the Scottish Premier League club before collecting the injury in the final game of his loan period. Scunthorpe boss Ian Baraclough could employ him as a left sided midfielder following the departure of Martyn Woolford to Bristol City.